Lake Lure and the Hickory Nut George offer a wide array of activities from sight-seeing to fine dining. Whether it's the adrenaline boost of zip lining or the relaxation of the fresh mountain air you seek, our beautiful area offers both. Chimney Rock Village has an assortment of unique shops, an ice cream parlor, and the scenic River Walk for a soothing afternoon stroll. Chimney Rock State Park offers miles of trails, from moderate to strenuous, all with breathtaking views. 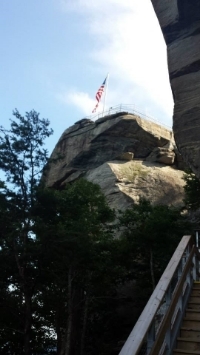 Chimney Rock State Park is a must-do on your trip to Western North Carolina. Take a deep breath of refreshing mountain air, become invigorated by the hiking trails, marvel at the abundant flora and fauna, and let your cares fade away. This is the perfect place to reconnect with nature and enjoy gorgeous views for 75 miles. The park is proud to be part of the Blue Ridge National Heritage Area and is located just 1.5 miles from The Arbor. Maybe you live in the city, and have to spend too much time in the car to actually get outdoors? Not here! The first stop for many of our visitors is our beloved Flowering Bridge, a charming community garden project that lets locals and travelers connect through their love of nature. Try the Rocky Broad Riverwalk in downtown Chimney Rock Village, an easy one-eighth of a mile trail featuring boulders, rushing water, stone bridges and access to riverfront shops and restaurants (take off your shoes and refresh your tootsies in that crisp mountain water!). Other great options in Lake Lure include the Dittmer-Watts Nature Trail Park, Morse Park and Buffalo Creek Park. Our mountains contain hundreds of beautiful waterfalls including the nearby Hickory Nut Falls waterfall at Chimney Rock State Park. Hike this trail to experience the second highest waterfall of its kind east of the Mississippi River. We also highly recommend hiking the waterfalls around Dupont State Forest. Still can't get enough? Head west to Transylvania County, the "Land of Waterfalls." Giddy up! Whether you're taking a mountain ride or moseying along the river, Lake Lure has two wonderful stables, one of which is sure to be just your speed. Spectating more your thing? We're just 1/2 an hour away from the Tryon International Equestrian Center, host to the 2018 World Equestrian Games as well as regular free demonstrations & competitions. Don't feel like cooking while you're on vacation? Never fear: there are more than a dozen restaurants within a ten minute drive from The Arbor Cabins--plus awesome cafes and not one, but *two*, ice cream shops. From casual to fine dining, there is something for everyone's palate and budget. Shopping in this area offers a broad range of wonderful regionally handcrafted items such as jewelry, quilts, clothing, and woodworks. Lake Lure is conveniently located so that you can visit the unique shops of Chimney Rock Village, Manual Woodworkers and Weavers, and the boutiques of Asheville, Black Mountain, and Hendersonville. You're sure to find souvenirs for yourself as well as unique gifts for family & friends!